CNN has yet again taken #1 spot as the biggest international news brand in the annual Ipsos Affluent Survey Europe. 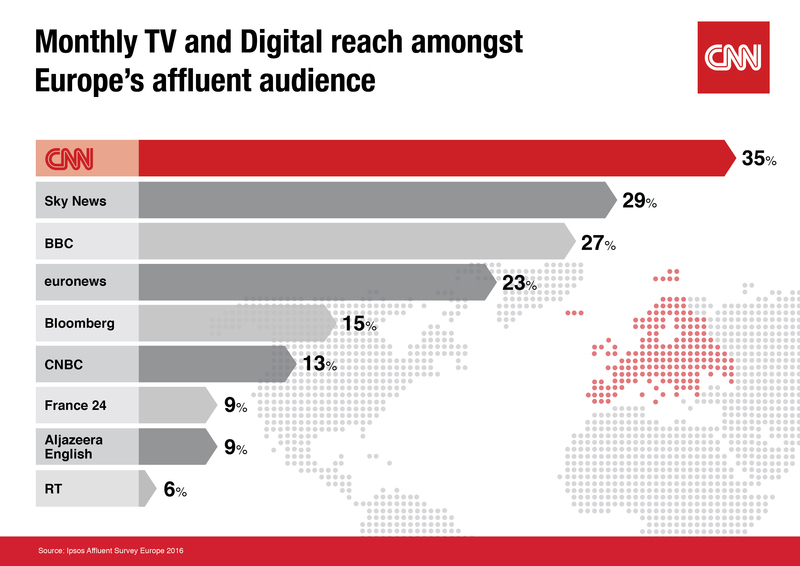 The independent industry research study, out today, shows that CNN reaches 35% of Europe’s elite population* every month via TV or digital platforms** – the most important audience metric for pan-regional advertisers. This is 21% ahead of Sky News, 26% ahead of the BBC and 50% ahead of euronews. All other international news brands are even further behind. CNN is also #1 international news brand in monthly cross-platform reach amongst core audience segments of C-Suites (50% reach across Europe), Luxury Consumers (50% reach), Business Decision Makers (48% reach), High Income Earners (54% reach) and Frequent International Business Travellers (63%)***. Again – this is far ahead of all other international news competitors. In 1995 EMS was designed to expand the Pan European Media market and to allow comparative analyses on a national and multi-national basis. EMS contained significantly more detailed demographic, classification and marketing data than any other survey available at the time or indeed now. The Affluent Survey Europe is part of the Ipsos suite of Affluent surveys which now covers Europe, The Middle East, Africa, Asia/Pacific, Latin America and the USA, spanning 51 countries and reflecting approximately 133 million adults. Since its first launch, the Affluent Survey Europe has continually evolved and enhanced its methodology. Ipsos interviewed 27,751 Europeans across 21 countries in 2015, each of whom was screened to ensure they passed certain minimum household income thresholds established as representing the Top 13% population. CNN’s portfolio of news and information services is available in seven different languages across all major TV, digital and mobile platforms reaching more than 420 million households around the globe. CNN International is the number one international TV news channel according to all major media surveys across Europe, the Middle East and Africa, the Asia Pacific region and Latin America and recently expanded its US presence with its launch on CNNgo. CNN Digital is a leading network for online news, mobile news and social media. CNN is at the forefront of digital innovation and continues to invest heavily in expanding its digital global footprint, with a suite of award-winning digital properties and a range of strategic content partnerships, commercialised through a strong data-driven understanding of audience behaviours. Over the years CNN has won multiple prestigious awards around the world for its journalism. CNN has 41 editorial offices and more than 1,100 affiliates worldwide through CNN Newsource. CNN International is part of Turner, a Time Warner company.